6th: Comfort food – Something that always cheers you up. When I am needing some comfort, there is nothing better than falling headfirst into a great big pile of vegan mac and cheese. I actually had no opinion on mac and cheese before going vegan, it wasn't something I really ate that often. Of course now, I am obsessed! And I know I am not the only one, I suspect there will be quite a few comfort food posts dedicated to this glorious creation. In honour of mac and cheese, I present a short round up of some of the special times we have had together. 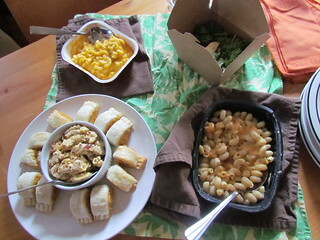 I can never forget the amazing mac and cheese party I had with Helen and Molly during my last trip to Seattle! All the different types of vegan mac and cheese we could find in the freezer section of Wholefoods and similar... plus some kale salads for balance. 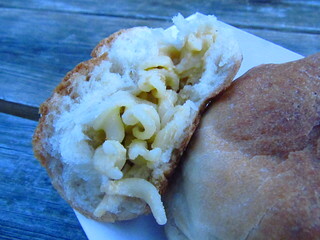 Last year, in Austin, I had a delightful mac and cheese stuffed Kolache from Bistro Vonish. A little sweet in the dough, but loads of fun! I love the mac and cheese at Veggie Grill. I am still waiting for their global expansion to Australia! I am always grateful that I got to try the Mac and Cheese Burger at White Owl Social Club in PDX before they took it off the menu. 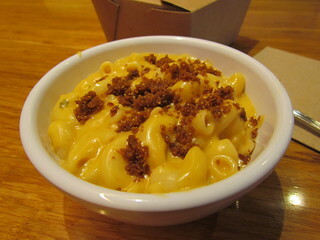 Everyone in Seattle knows about the delicious Mac'n'Yease at Plum. One time I went and they had Smoky Mac, which is even better! And of course, I love making Mac and Cheese recipes at home! My favourite is the Cheezy Mac from Vegan Diner by Julie Hasson. It is a cashew-based mac and cheese that will blow your mind! Mac and cheese is such a fun food, and there are so many more things I have done with it. Grilled mac and cheese, mac and cheese jaffles, mac and cheese burritos or tacos, mac and cheese nachos, mac and cheese pizza... really, the possibilities are endless for this glorious and happy making food. What is the most unusual way you have eaten mac and cheese? When I moved away to uni, Possum stayed at home with my parents. But I couldn't be without a cat for too long. Regular readers will know Dim Sim very well, she is on the blog a lot. My perfect little black princess! 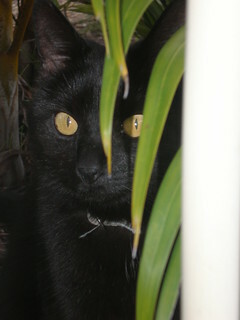 She was found as a teeny kitty in a horse paddock, and adopted by myself and two housemates at uni. But it became clear that we were destined for each other, and we have been together ever since. Actually, as I was writing this she just gave a little mew from her chair. Dim Sim says hi! I don't believe I've tied the Cheezy Mac from Vegan Diner. I shall remedy that very soon! The most unusual way I've eaten mac and cheese? Hmm. I'm not very adventurous with flavors, so I'll say mac and cheese with brussels sprouts in it. That's not really weird though, is it? Brussels sprouts are pretty delicious, I have had them on the side of mac and cheese but I don't know that I have put them in mac and cheese before! A mac and cheese burger?? I agree with you all the way. 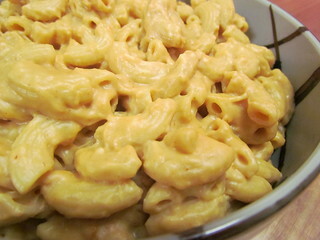 In my pregan days I never thought too much about mac and cheese, but as a vegan it's a whole different story! I feel boring though because I haven't really tried anything too crazy with it! Even mac and cheese straight up is still a delight. I also love mac n cheese, and if you go to mac n cheese parties it sounds like you're definitely friends with the right people! I'm going to check out the Vegan Diner recipe now. I loved that mac and cheese party, it was like all my dreams come true! Ahh I love this, a mac & cheeze greatest hits! I think the most unusual thing I did with M&C was either putting it in a pie, or on a pizza. Both were superb. Something about that extra layer of carbs, so great! I completely agree that I'm much more obsessed with mac & cheese since going vegan than I ever was before. In my teens and early 20's I'd occasionally have a boxed mac & cheese, but it was out of convenience more than taste. 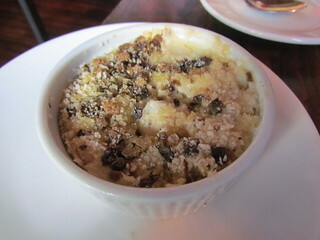 Then after I went vegan and discovered cashew-based mac and cheeses, forget about it! It's amazing on every level. My all-time favorite is Kittee's from Teff Love. When I only have a little bit left, my favorite thing to do with it is stuff it in a burrito with gomen & anything barbecued like BBQ Soy Curls, tofu, or Gardein chickn. They do something similar at Homegrown Smoker. I have had that burrito, very delicious! So much deliciousness! A mac & cheese party sounds like my kind of party! Mac & cheese burger sounds like heaven!! 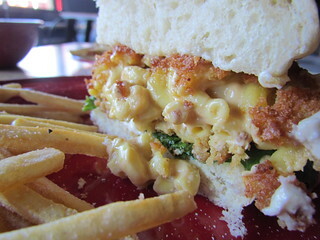 zomg the mac n' cheese burger! I love mac n' cheese, but I grew up on the stuff, so it's been a comfort food for me for a long time. It's so good. I haven't really ordered it at many restaurants though - I should do that as it looks like there are so many creative ways to enjoy it. I want to try mac n' cheese pizza! Mac and cheese pizza is two of my favourite foods combined. Heaven. I feel you about learning about new comfort foods while going vegan. In the states (in our area at least) baked beans are sweet and sometimes called Boston Baked Beans. Then one day I got a recipe for baked beans that are more British, and we fell in love. There are other foods like that, weird right? I noticed when I started making baked beans from US cookbooks they were definitely sweeter, lots of maple.